As I mentioned in my last post about the Mint App, I’m trying hard to find ways to save or make money using my iPhone since it costs me about $70 a month to own it. That said, I’ve been spending some time reviewing different mobile applications, most financially-related, to find the best ones out there. Here’s my review of the USAA app. 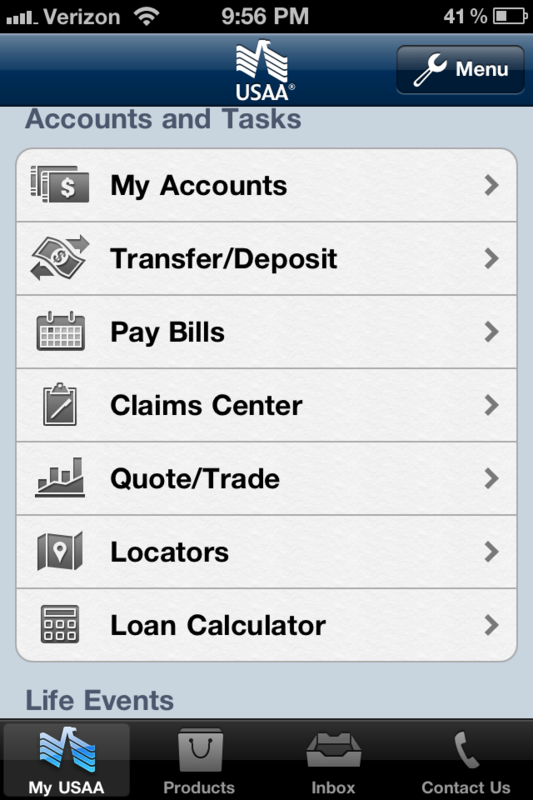 Many of the features of this app make mobile banking easy. USAA integrates the “Use my location” feature so that you can locate nearby ATMs. It even breaks down the ATM and service options by what you want to do, such as “Withdraw cash” or “Deposit checks” or even “Discuss investing.” However, when I went to do this, USAA couldn’t locate several of the available features near me, and I live in a decent-sized city (oops!). One of the other aspects I like a lot about this app is that I can do basically everything I would normally do on the USAA website. The app isn’t limited (like the Mint one is in some ways), so I can view my accounts, transfer money, and pay bills, too. While there are some features thrown in there that I don’t really use, it’s not cluttered up with extra advertisements or other features that are annoying or not useful. You can also make deposits simply by snapping a picture of a check using your iPhone. From there, the amount on your check is deposited into your account, and there’s no need to do anything else. 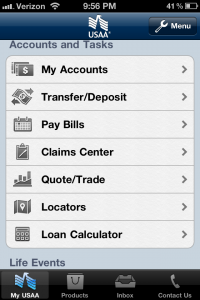 The USAA app features a very clean interface where it’s easy to navigate through the menus. Everything is very clear and easy to learn and follow. There aren’t too many bad things to say about the app. One downside is you need to meet certain requirements to access the feature that lets you deposit a check using your iPhone, and I do not meet those requirements myself. I’m not sure if they’ll remove this requirement in the future (it’s tied to whether or not your a military veteran or related to one), but it’s only a small issue. I don’t use this app a ton since I like the Mint app so much more. But I do go on here to make some quick transfers between my checking and savings accounts from time to time. I also use the ATM locator sometimes as well. Aside from that, I prefer to do save the more involved stuff for when I’m on my laptop since it is still easier to use the USAA website. Overall, I would rate the USAA app a 9.5 out of 10. It’s a must-have for anyone with a USAA account, and it’s really another good reason to open a USAA account if you don’t already have one. At the low price of “free,” you really can’t go wrong with this one. Click here to access the USAA Mobile app on iTunes. Do you use the USAA app? Are there other apps you would like me to review? I’ve gotta admit that I wasn’t a big fan of Mint. That is, until I got the iPhone 4S in October and downloaded the free Mint app for iPhone. One of the things I was excited about when getting a smartphone for the first time (which I would consider an expensive toy and generally a money-loser) is that I’d at least be able to find some ways to save money using my phone. Since I feel tracking spending is a big part of managing finances, I’ve been very pleased using the Mint App on my iPhone. The App itself is very sleek and easy to use. Here are the features of the app that I use the most. My favorite feature of the Mint App is the ability to add cash expenses on the spot. To me, the hardest part of tracking my spending is keeping up with where I spend cash after I take it out of the ATM. With the Mint iPhone app, I log cash purchases immediately after leaving a store or restaurant. In less than 30 seconds, I can log the amount of a purchase, the category it goes in, and where the purchase took place. No more waiting until I get home to log it into my spreadsheet. Another feature I like about the Mint App is the ability to check different account balances on the fly. I can check all my bank, debit, and investment balances on my phone since Mint syncs with all of these accounts. I’ve simplified a bit since I’ve stopped using credit cards for now, but if I do go back to using credit, it will be great to see all those balances in one place, too. With the Mint App I can also see how I’m doing in terms of my monthly budgets in each category. I haven’t taken a whole lot of time to set up budgets yet, but I can see this being handy when deciding what to spend while I’m out. You can view your budget and spending in chart form if that’s helpful for you too. There’s also a news feed within the app to tel you if there’s errors with your accounts or if you’re over budget in a certain category. One complaint by me (and many others out there) is that you can’t split transactions you enter on the mobile app. That’s a little disappointing, but it probably affects less than 10% of my transactions anyway. Plus, you can always go back later and update transactions online instead. All said, the Mint mobile app has made me a loyal Mint user now! Using Mint is probably the best combination of easy and effective budgeting. 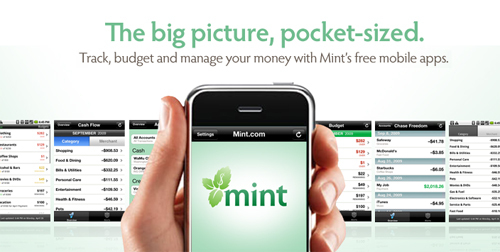 Do you use the Mint app? Is there another mobile app you use instead? p.s – I’m interested in financial mobile apps, so I think I’ll review a few more on here. If you have any you’d like to see, let me know.